The most important thing about today is my mother's birthday. She is bold, and fierce, and amazing. I learned about seeing the small things, and looking up, and making use of good weather (weather too nice to waste it inside!) and how to tack a sailboat (don't pinch it too close to the wind) and cook a chicken, and be brave and be silly. so, I found a fabulous fabric store nearby, and succumbed to a handful of variegated wools (good for hand stitching) and a pile of batiks that make me happy, for later. This is a leaf from an oak tree next to the rehab where my father is. 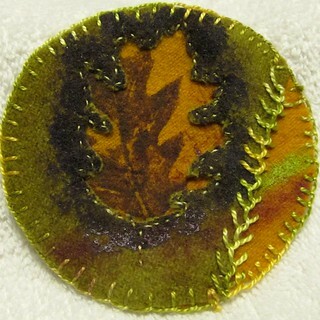 It is too new and tender to take much rubbing or scraping, so I found a little jar of paint, and dabbed it on with my finger – it made an empty shape around the leaf on the green fabric, so I cut it out, and let part of the printed leaf show through. Then, because I had a lot of time and nice thread, I did a lot of stitching on it. Also sewing on wool is lovely. Thanks, Cynth!! I will try to live up to the picture you have painted of me.